Back to this project -- I have been itching to make some little changes in both my kids' rooms. I really, really wanted to add some orange to Preston's room and finally got around to it. He previously had his name spelled out across the top of his bed, but I felt like just his initial fit his age better now. So here's what I did. The original plan was to have Grant cut me a board, but then I remembered I had this old picture that was already close to the size I needed and the edges were already routed. So that's what I used. Primed the board with kilz and then painted it white. Taped off my stripes and painted gray stripes. While I was at it, I also painted his lamp base and these star hooks (which I still need to hang). I still have plans to add things to this wall, but this is were we are today. Here's are some other plans I have for this room. 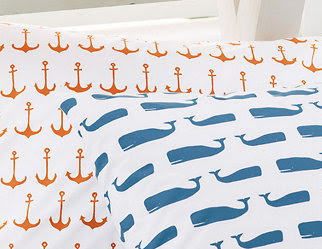 Not really planning on doing a nautical theme, but just love the prints and the colors. Let me know what you think -- orange anchors or blue whales?? Back with updates soon! I love the prints and colors! I especially love the pop of orange agains the white/grey. Our nursery is going to have grey walls and I'm incorporating color with the curtains, crib bedding, blankets, pillows, and I 've been contemplating an initial on the wall. We aren't sharing the name until birth so just the first initial would be fantastic. I love that you popped it with color. I will definitely consider this. Hey Lins! Thanks for sweet comment! 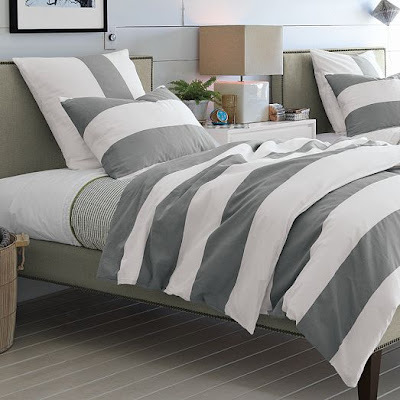 So excited to add some orange and super excited about the new bedding! Congrats to you on your baby - so exciting!! Can't wait to see your nursery! Love that color combo! So cute!! Love the initial canvas. The prints are awesome too! Love it!! Oh, it's going to be so cute when the room is finished! This looks so easy. 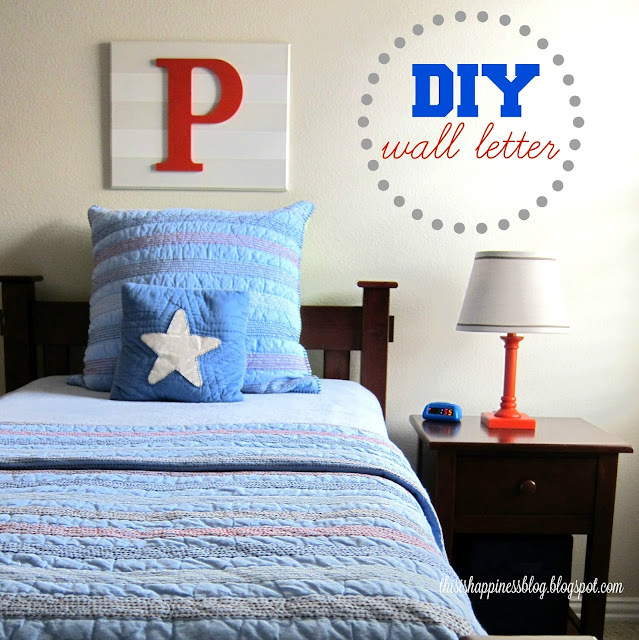 I love having letters on the walls! Really Cute! Love this idea! Thanks for sharing! Visiting from the "My Fashion Forward" link party. I love this wall art! I think I want to do this for my kids rooms (& possibly even mine)! Thanks for sharing! Oh, and I love the pillows too. I would love for you to come visit my blog. That is gorgeous! I need to redo my girls' rooms. Though, I got the feeling that they have come to the age where they only want to do it themselves. Well, I can imagine it.